Today is a very important day my friends, for I am taking part in the 'Blog the Change for Animals' in which pet bloggers from all around the world come together to support people who are helping animals in need. Today, I want to share with you a cause that is very near and dear to my heart. 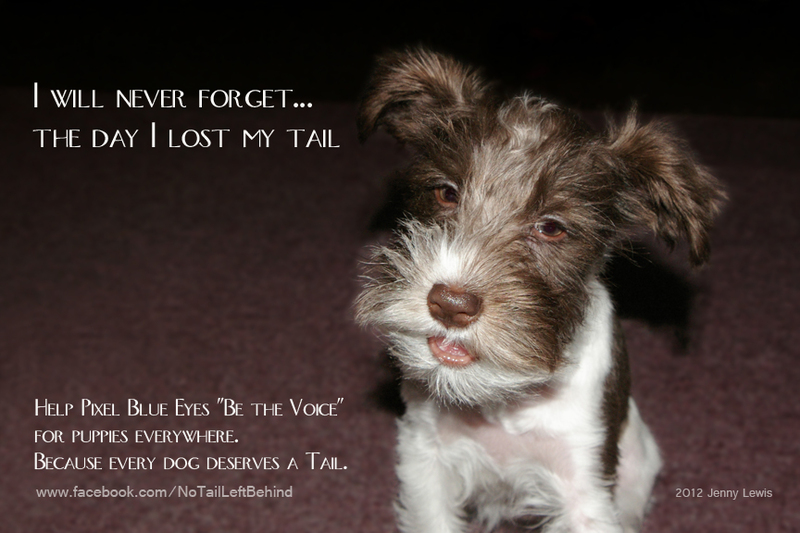 No Tail Left Behind is a campaign that I started in April to educate people about the difficulties and suffering that dogs endure from tail docking. I am in a unique position, for I am a dog with a docked tail who has suffered since puppyhood from stabbing tail pain and stinging nerve pain at my docked tail tip. You see, my tail was taken from me, just like it is for thousands of puppies each year, when I was just a few days old. The 'reason' for amputating part of my spine with no anesthesia or proper surgery, is because breeders of certain dog state it is the 'breed standard' to dock certain dogs tails. Not many people realize that tail docking involves the severing of tendons, spinal vertebrae, muscles and nerves. Some dogs do fine later in life with a docked tail. I did not. 1. Biting, licking, 'chasing' or whining at the tail or back end. 2. Hiding under a bed, or in a crate. Isolation from the family or laying alone in a back room. 3. Difficulty potty training, either on paper or outside. Often difficulty having a normal BM, including running away from a BM as it is occurring. 4. 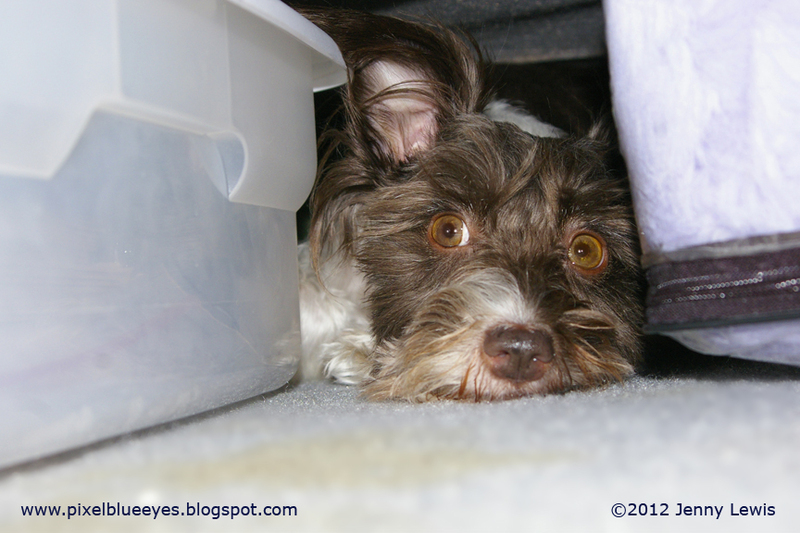 Unexplained potty accidents, even if they are potty trained. 5. 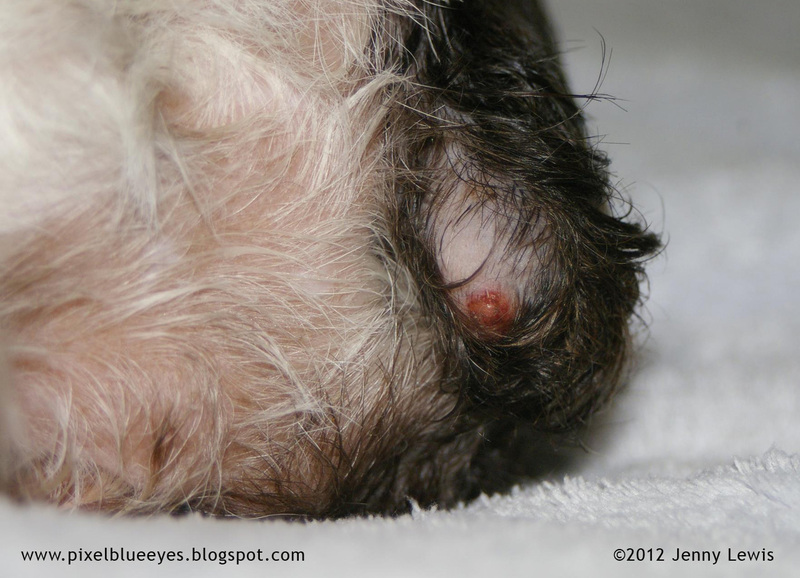 Redness, inflammation or scaling at the tail nub tip. I am 4.5 years old and mine still gets red and inflamed at times. 6. The dog acting like they are in trouble or are being punished, including crying out, yelping, or even nipping at someone who tries to pick up the dog, or touch the back end near the tail. 7. Getting excited over a loved one coming home or a fun play time, and then suddenly yelping and 'going after their tail. Whenever I get excited to see Mommy my tail gives me a fit. I can't even show how happy I am to see her without my tail stinging and hurting me. Excitement runs through the nerves in my tail nub as I wag with joy. 1. 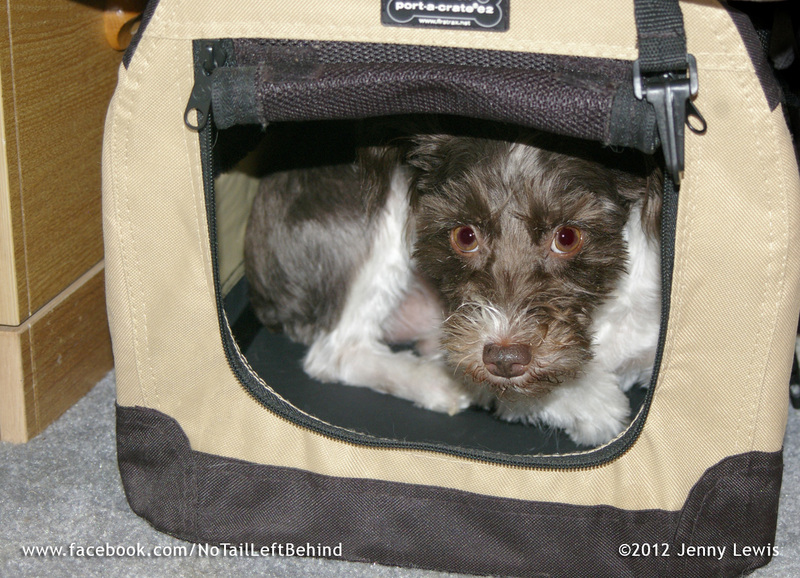 Setting up a 'safe place' where the dog can go to such as a crate, or a bed that is just theirs. Make sure you can easily access them if needed. I used to go under the bed, now I have a little crate I can run to if need be and Mommy can come comfort me. 2. Putting a sweater on the dog (amazingly this distracts me from biting at my tail). 3. 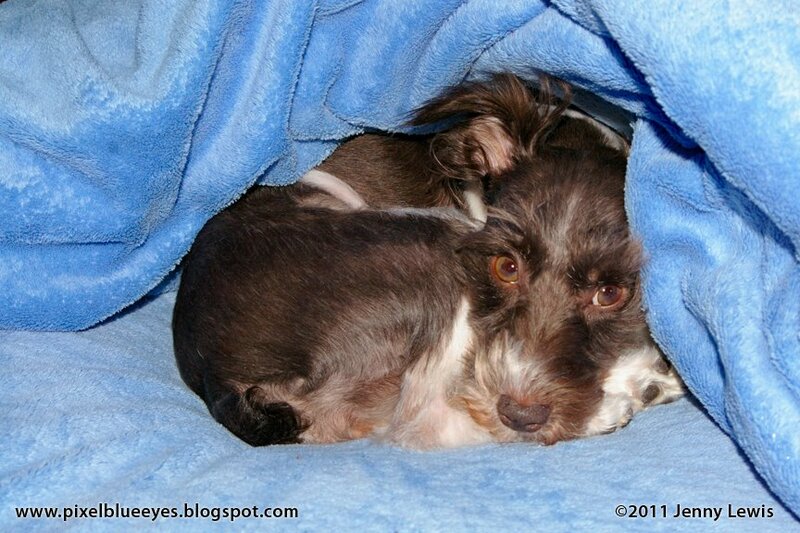 Help your dog snuggle into a comfy bed and gently wrap them in a blanket if possible. Sit and comfort them. 4. Talk to your vet about your concerns. I am on Neurontin for the nerve pain and I just started taking a natural supplement called 'Composure' that has Colostrum, the natural occurring hormone that puppies get from their mother when nursing. Mommy saw a marked difference in me on the very first day. 5. Corrective surgery is an option, and one that my family is now going to do for me. We've tried every other avenue and now we must take this final step to make my quality of life better. Make sure your vet takes you seriously, and if you feel your concerns are not being addressed...go talk to another vet. Docked tail issues are real and valid, and you owe it to your dog to do all you can to help them. This is a video that my Mommy took of me and it shows some of what I go through. She was actually going to video tape us practicing my tricks, but my tail had other plans. It started hurting me with that awful nerve pain and I could not concentrate and acted like I was in trouble. I know that tail docking is a touchy subject, but so is my tail pain. There are those who swear that one of the main reasons for docking is so that dogs won't 'hurt their tail', or 'get it caught in a fence and rip it off'. However, think about this for a moment...would a human remove a finger or an arm, because they 'might get it caught in a buzz saw' or 'might do severe damage to their finger while chopping vegetables'? See, that sounds crazy, doesn't it. Well, to me and my family, and to the multitudes of dogs with docked tails that hurt their entire lives, removing our tails sounds just as crazy. Why remove a body part because you 'might' get an awful injury? If injury was truly a valid reason, then why don't they remove the tails of military working dogs, or police dogs, or search and rescue and service dogs. We must help educate about cosmetic tail docking. Please help me spread the word about the dangers and difficulties that dogs go through. Let's help future puppies in the U.S. keep their tails. I, Pixel Blue Eyes, am in it to end it. I believe that every dog deserves a tail. Please join me in my campaign. 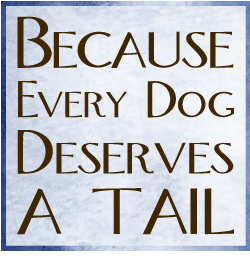 Visit my No Tail Left Behind page on Facebook, which has tons of helpful information, photos, encouragement, and stories from other dogs with docked tail issues like me. 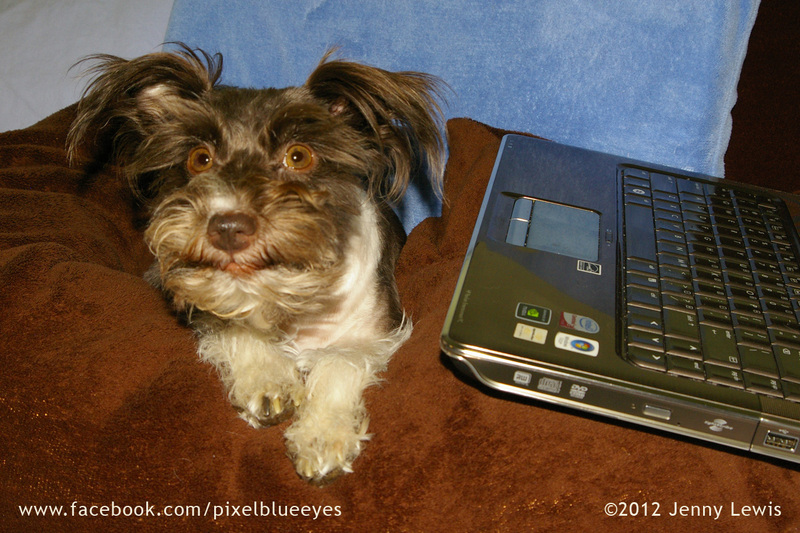 Help me Be the Change for dogs in the U.S. by helping me be the voice of dogs with docked tails. Our first goal is to educate, our second is to help end tail docking in the U.S. So many other countries have already banned tail docking and ear cropping, including Australia, the U.K. Brazil, Belgium and Italy, just to name a few. Tails are beautiful. Tails are one of our most expressive ways of communicating. We are planning on taking this campaign to Congress, so prepare to join us in contacting your local legislators. Please LIKE my Facebook page, where you can read my entire story and get much more information on tail docking. Also, please leave a comment of support below. Thank you for letting me share my story and my hope to help educate and stop tail docking. Remember, Be the Change for Animals. Together, we all can make a difference. Please visit some of these other blogs listed below who are Blogging the Change for Animals too. It is a horrific practice, that should be stopped. We are supposed to be so progressive here in the U.S., but when it comes to animal care and welfare, we so often fall short. Thanks again for spreading the word about the horrors of tail docking. Thank you for your encouragement and support. Mommy said she'd rather have a whole room full of giant tails wagging and knocking stuff over with glee, then to know what I have been through. You know I hear you don't you....and I'm on-board with the whole campaign of yours.....thank goodness Australia has already seen the light!!! Come on America...... it's not like you to be BEHIND in things that MATTER! Ban this cruelty NOW!!!! NOW!!! NOW!!!! Lots and lots of love, hugs and kisses to you and your sweet Mum Poots. This is so sad. It's totally cruel and mutilation. It's illegal here but still prevalent. I have had people ask me where they can dock tails of puppies and if I would do it. I have to take a deep breath and explain that dogs need their tails that is why they are born with them. Then they go and do it anyway. I asked one why she did it to her dog she said 'because it looks pretty'. Poor Pixel hope your surgery cures the problem get better soon. I promise to keep you posted when I have the surgery. Much love to you and Joey and all the dogs in your loving care. My son's service dog, attacks with Love has a docked tail. Tacks was a pound rescue. I had no idea. If I could I would get Tacks' tail back. thank you for the information. I am so glad to have become friends with you Malika. I truly wish we could get Tacks tail and my tail back too. Thank you so much for being a support in this. Oh Pixel, the thought of the pain you suffer hurts my heart. I live with nerve pain from broken ribs suffered in a car accident, but at least I understand what is happening and why. As your mommy said, you have no way to grasp why your own body is attacking you. I pray your surgery works -- and that tail docking is outlawed forever! I am so very sorry that you have to live with nerve pain too, from such a traumatic event. It breaks my heart for you. Yes, it is hard to understand, and I am getting to a point where I can't take it anymore sometimes. You are a treasured friend and I am honored to know you and share my joys and struggles with you. I too pray that tail docking is banished forever one day. Pixel, your blog has brought an issue to my attention that I had not given too much thought to previously. Thank you so much for the posts, the photos, and the videos (especially touching). Don't know why anyone feels a need to bring unneeded pain via tail docking - ears are another issue I question! Love you Pixel! Thank you for such a wonderful, heartfelt message. I am glad to have been able to share my story with you. Before Mommy and I found each other, she was unaware of how tail docking truly affected dogs either. It has been a really educational experience for her as well, and we have learned together. We agree that ear cropping is awful too. Plus, Mommy just learned a terrible physical after effect of dew claw removal in dogs. She will be posting the study's finding on my "No Tail Left Behind" facebook page in the next few days. Thank you so much for such a wonderfully generous offer of helping bring more attention to our campaign to end tail docking. Education and spreading the word is so important, and needed right now. We need all that you mentioned, for the more followers and likes we have, the more people we will reach. I will definitely be contacting you to ask for your assistance in helping spread the word about No Tail Left Behind. 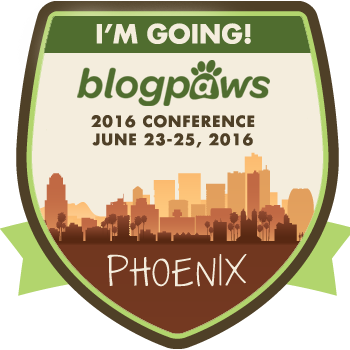 It is an honor to be a part of Blogging for a Change! What a great cause! Poor Pixel...I hope your surgery works and you aren't in pain anymore. I'm so glad to see you bring attention to this issue - I could not agree with your message more. Great post for Blog the Change - I'll be sharing it! 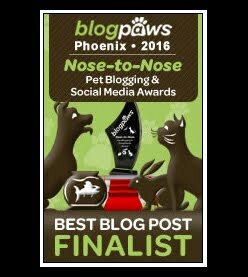 We liked your blog so much that we are back with an award to pass on to you! We even liked both of your Facebook pages! Thank you for sharing! Personally do not enjoy seeing an "altered" ear or tail : ( What happen to natural beauty???? Like "nature Made and keeping it that way"
I have always had an aversion to the docking of ears and tails. It is wonderful to hear about what your doing. Poor little Pixel. It's hard to believe that people still do this. Barbaric! Dear Pixel, thank you for sharing this wonderful post. I just read about your surgery...poor sweetheart! You're blessed with a great family that loves you truly and deeply.